There’s a common straw man concerning those of us Jesus has sent into the mission field of online apologetics and discernment ministry—which He’s continuing to develop—erected by many of those whose doctrine we criticize; and that would be, we are haters who’re striking out in anger. Nope; sorry about that chief. I happen to know most of the major ministries, and while covering the first waves of this tsunami of apostasy that is washing over squishy evanjellyfish, we most often write in sadness. I told you before here at Apprising Ministries that I’m essentially just documenting these things so people will have no excuse. A case in point is my writing concerning the sinfully ecumenical neo-liberal cult of the Emerging Church—a veritable Trojan Horse full of heresy—headed by, among others, the unholy Emergent Church trinity of apostates, Living Spiritual Teacher and EC guru Brian McLaren, universalist Emerging Church pastor Doug Pagitt, and his friend Tony Jones, the progressive “theologian in residence” at Solomon’s Porch. I’ve told you that part of their loathsome legacy is their bringing into the mainstream of rapidly apostatizing evangelicalism a new postmodern form of “big tent” Progressive Christianity—a Liberalism 2.0—sometimes referred to by these rebels against the final authority of God’s Word as Emergence Christianity. Their doctrine has about as much to do with the historic, orthodox, Christian faith as the Dalai Lama, whom EC rock star pastor Rob Bell bowed before last year and called: His holiness. So thanks to FTS, for example, we’d been able to come to know that Doug Pagitt Points Us To Michael Dowd. Who is Michael Dowd you ask? Well, you probably don’t want to know; and if it weren’t for apostates like Doug Pagitt being sponsored, published, and supported by ostensibly evangelical seminaries, publishing arms, and churches, you’d likely never have heard of him. Ah yes, Biblical Christianity Is Bankrupt; very nice. And thank you FTS, and Doug Pagitt, for making sure we’d know this “important” information. In Michael Dowd And Science Fiction Christianity I gave you the transcription of Dowd’s sermon “Evolutionize Your Life: Heaven Is Coming Home To Reality,” which was given at another spiritual blackhole called C3 Exchange. Michael hasn’t called in yet,…here’s what I’d like to talk to him about: I like what he’s up to…he’s written a book called, Thank God for Evolution and his argument is that there’s this big thing going on in the larger story of the cosmos and that it’s not at all inconsistent with Christianity; it’s not all inconsistent with the Hebrew faith, it’s not at all inconsistent with the other great faiths of the world. 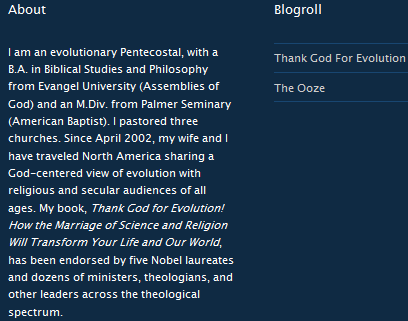 Interesting; Pagitt likes “this big thing” Dowd’s teaching, which is supposedly the deeper and “larger story of the cosmos”; O, and furthermore says Pagitt, “it’s not at all inconsistent with Christianity.” *Furiously wiping the mud off our windshield* Huh; sin is good, and God is an impersonal force—Luke, I am your father! This is consistent with the Christian faith; a faith anchored in the Biblical revelation of the one true and living God, Who by His grace sent the Person of God the Son, Who in turn offers forgiveness of sins so we can be regenerated by God the Holy Spirit and worship our Lord. We are neither stewards, nor cartakers, nor anything else that assumes we are seperate from nature. We have no existence apart from the living Earth. We are Earth. We are the self-conscious and spiritually aware organization of elements of this living planet. God,…can be understood as…the One Creative Reality that is not a subset of some larger, more comprehensive creative reality. God is that which sources and infuses everything,…[the] Ultimate Reality and our relationship with Him/Her/It… With an understanding of “God” as no less than a proper name for Supreme Wholeness, prayer can be understood analogously as a cell in deep communion with the larger body of which it is part. I think whatever facts there are, however God reveals God-self to humanity isn’t done in secret. This is what I like about what Michael’s getting at, I think he’s getting at that there’s this really long story (as he calls it the “fourteen million year story of what God’s up to) and I think that that’s far more interesting and this idea that, well, no there’s these certain people who have access to the truths of God that are special and other people don’t have access to those…that’s something that’s always made me uncomfortable. We’re going to talk about this universalism thing…that’s where I wanted to go with Michael…or I’m going to play the role of Michael. I don’t need Michael to make my point today. I’m going to make my point today, I’m going to tell it the way I want to tell it because I think there’s a bigger story. Universalism isn’t even big enough because the universe isn’t big enough. We gotta’ get into the entire cosmos. Whoa! *Digging us up out of the mud bog we’re now waist deep into* O no, of course Jesus wasn’t saying the path was narrow; we know that was coded language for us enlightened neo-Gnostics. Didn’t you know silly grasshopper, Jesus was actually saying: You need to see the bigger story that we are Earth and God is that which is Ultimate Reality; and so, we then come into a right relationship with Him/Her/It as God-self when we realize the path that we’re all cells in deep communion with the larger body of which we are part. I don’t know about you, but I’m really having a hard time understanding why any seminary that would claim to be Christian would sponsor this campy Star Trek theology. But to put this into proper perspective for you; Fuller Theological Seminary is sponsoring, not Christianity, but pagan universalism. Michael Dowd, Earthspirit: A Handbook for Nurturing an Ecological Christianity [Mystic: Twenty-Third Publications, 1991], 93. 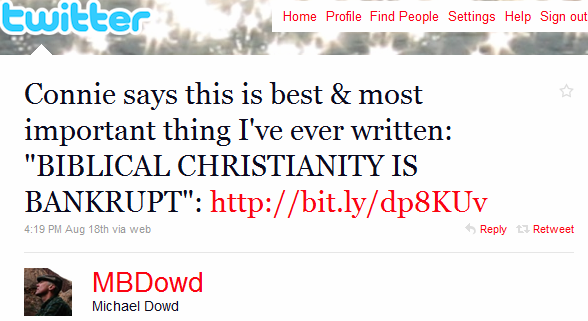 Michael Dowd, Thank God for Evolution! : How the Marriage of Science and Religion Will Transform Your Life and Our World [Council Oak Books, 2007], 108, 112. September 19, 2010 Segment 5 – Universalism is too small Doug Pagitt Radio, transcript on file. 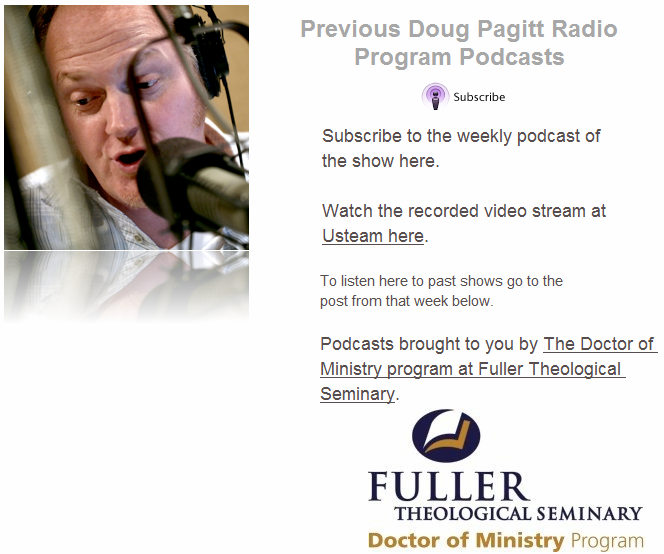 September 19, 2010 Segment 6 – Universalism is too small Doug Pagitt Radio, transcript on file.